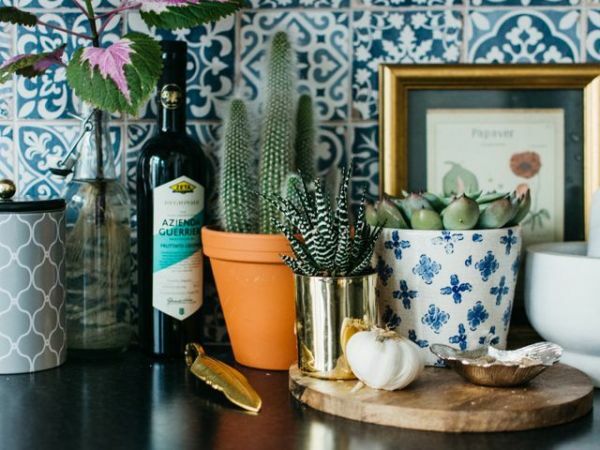 This is what happens when a woman from London and a man from Texas meet, get married, and move into a Mid-century ranch house on the bayou in Houston. 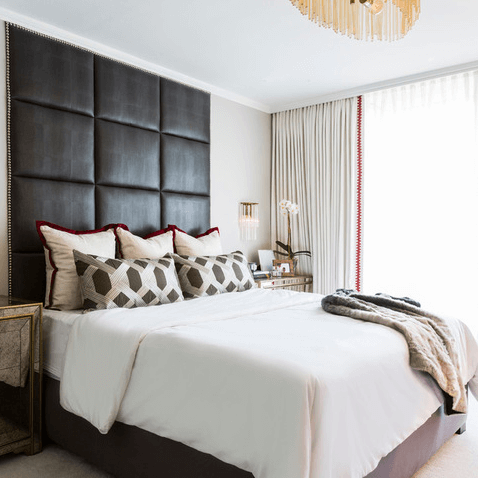 “They wanted a fun, relaxed and unique interior that married his contemporary style with her whimsical style,” says interior designer Laura Umansky. 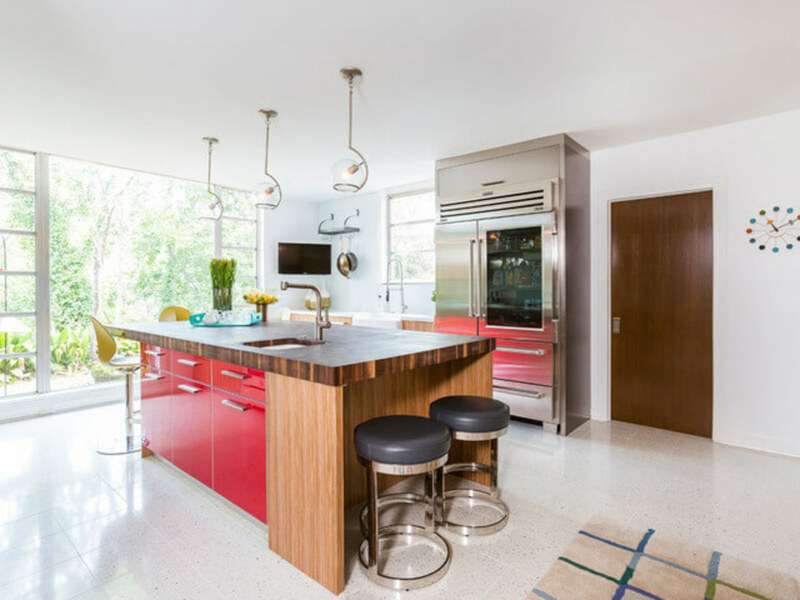 The redesign was a complete renovation that paid homage to the 1950s home’s roots, with layers of shagadelic London 1960s style and Texas spirit too. The den is a comfortable yet stylish space where the family can hang out together, watch TV, and relax. 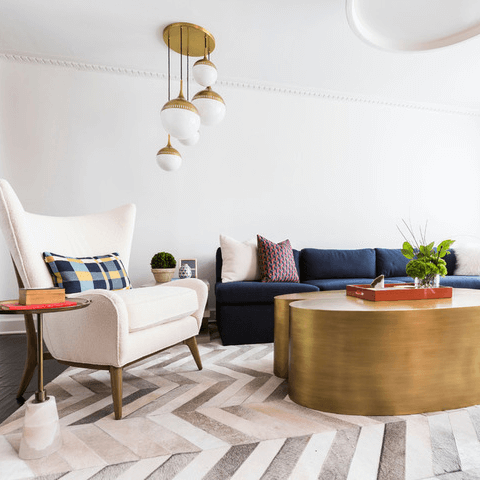 Large-scale items, including an oval light fixture overhead and a large metallic coffee table, make design statements and fit the room’s proportions. “The aged-brass cocktail table consists of two parts that speak to each other,” Umansky says. The large piece adds shine, heft, and artful geometry. 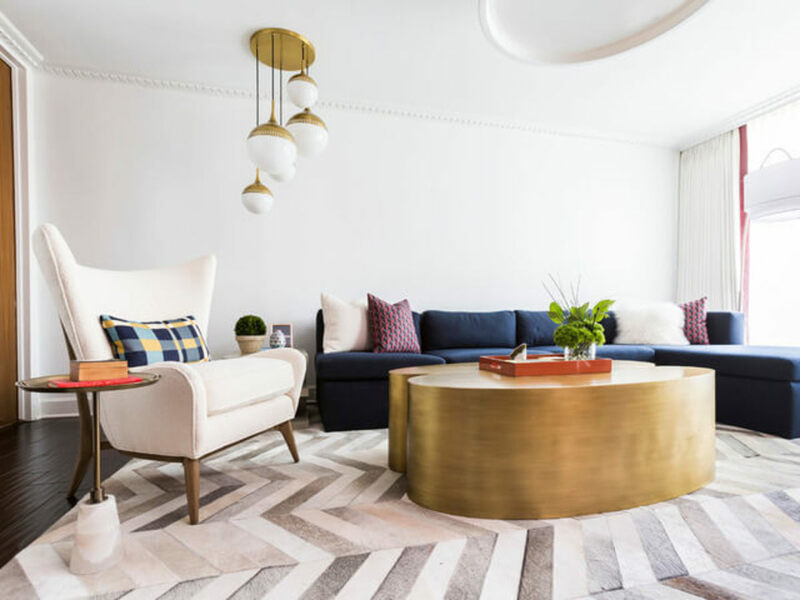 A cowhide rug brings in some Texas in an updated zigzag pattern, while the pendant lights add a playful '60s vibe. 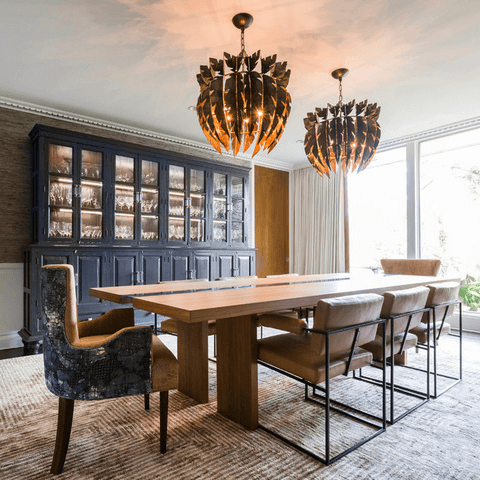 “The living room floats between the den and the dining room, making it a perfect space for entertaining,” Umansky says. She was able to preserve the original fireplace surround, which keeps the spirit of the original architecture alive. White paint gives it a clean update. A tufted leather console, furry bench, wood side table, and brass accents keep the texture mix interesting. Red, white, and blue hints at the flags of both the U.K. and Texas. Brass statement pieces like the light fixture are repeated throughout the house. Large windows look out at the backyard, which is lush and green. The end of the yard drops down and meets the bayou. “It’s very quiet and secluded, right in the middle of Houston — you almost feel like you are not in the city,” Umansky says. A mudroom-utility room is open to the kitchen, and its prominent Smeg refrigerator inspired the color palette for the entire space. 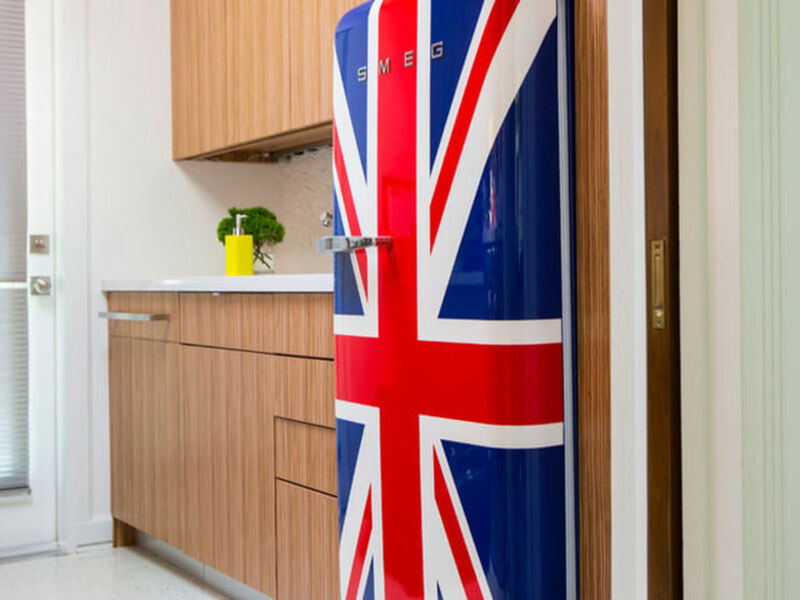 “Because one of the homeowners is from London, this Union Jack refrigerator was a must for her,” Umansky says. The kitchen received a complete overhaul; only the original windows remain. 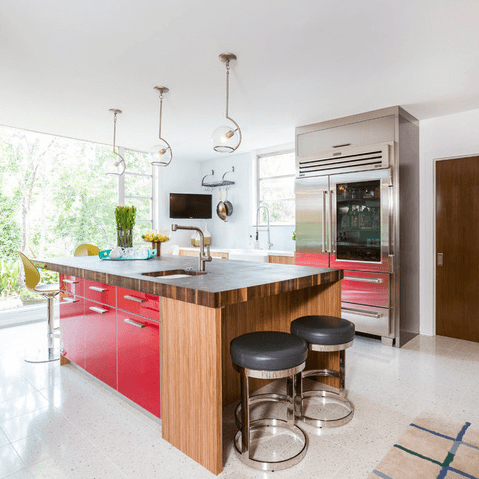 A large central island serves as a workstation and gathering hub, complete with a walnut butcher block top they can use as a cutting surface. 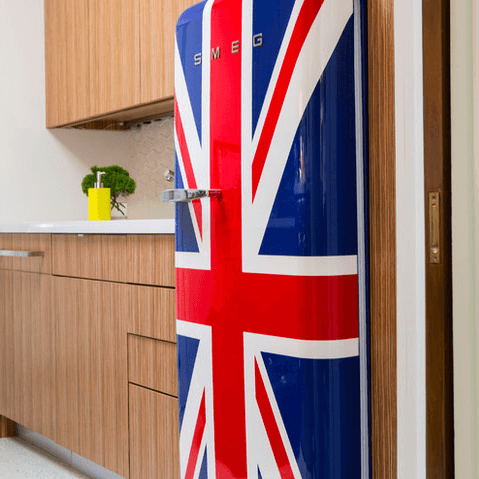 The red from the U.K. flag found its way into the kitchen via lacquered cabinets in the island. 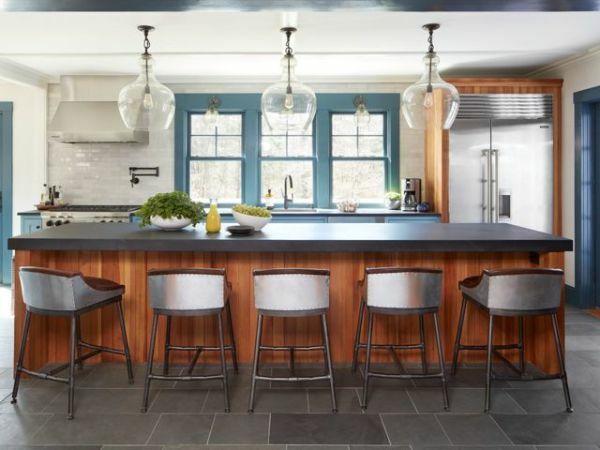 Yellow counter stools add another fun primary color. The kitchen offers vast backyard views thanks to the large windows. An Aga range gives the English homeowner another touch from home. The dining room sits between the kitchen and the living room. The luxe Lee Jofa fabric on the back of the custom host and hostess chairs inspired the palette of deep blue-grays, browns, and caramel. 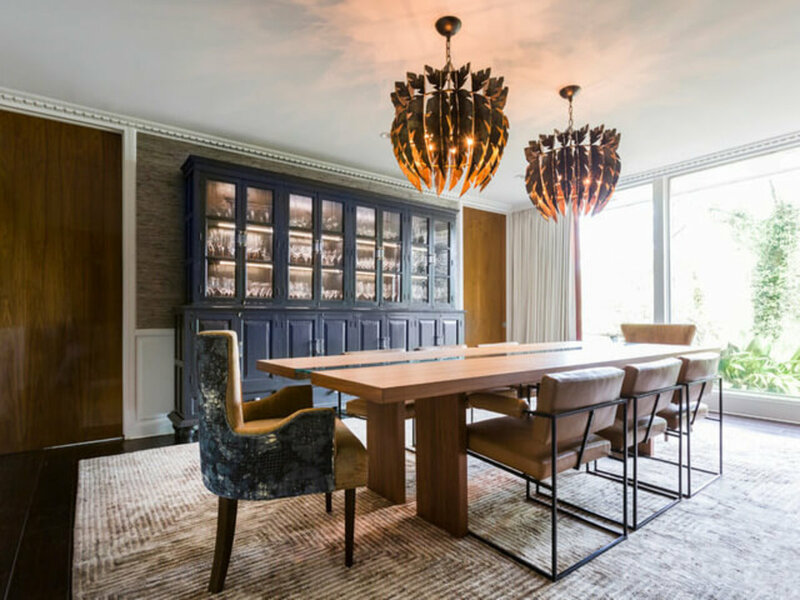 The owners already had a large china cabinet, which Umansky customized with new hardware, interior lighting, and a new finish of Sherwin-Williams’ Iron Ore paint. The 118-inch-long walnut dining table seats eight to 10. The Thayer Coggin side chairs feature black powder-coated frames and caramel leather upholstery. A rug brings in a luxe texture and quartz colors. A pair of antique-brass sculptural lights composed of palm leaf shapes provide the finishing touch. 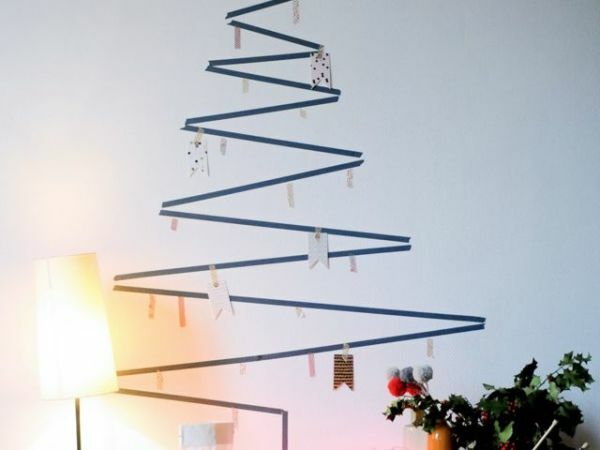 It takes two to match the nearly 10-foot table. “The [fun] color palette from the rest of the interior continues into the master, but becomes deeper in tone and much moodier,” Umansky says. The focus in the master is on texture: a mix of leather, antiqued mirror, crystal, and textiles. 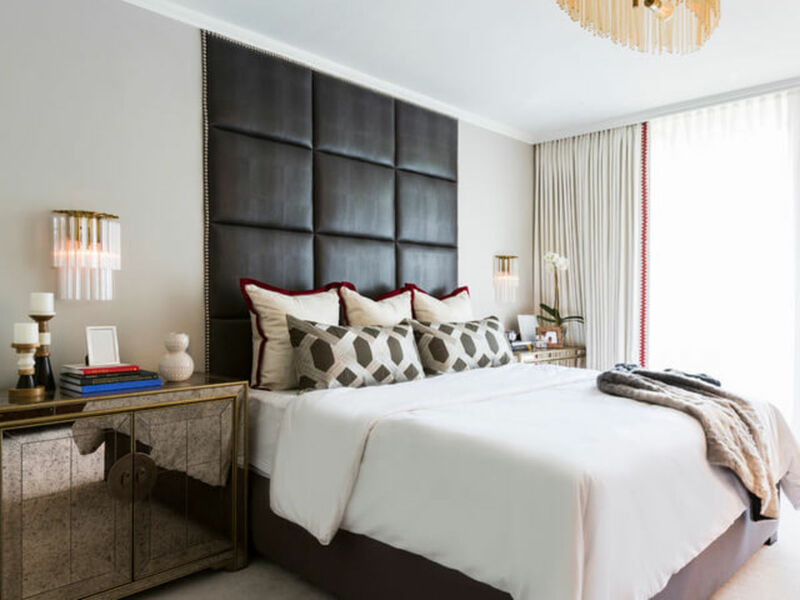 Mirrored chests used as nightstands add a glitzy touch. 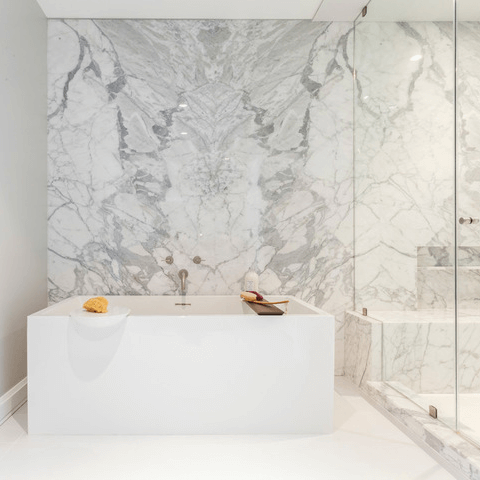 Three book-matched slabs of a stone called Sea Pearl extend from tub through shower in the fully remodeled main bath, and a heated towel rack adds one more luxurious touch.